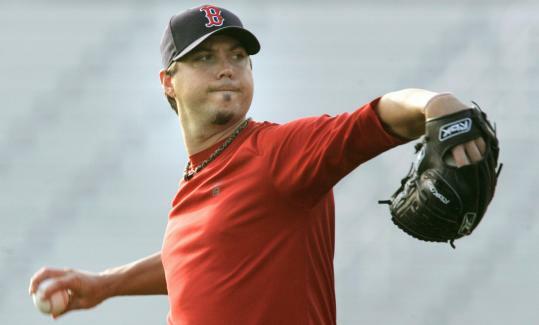 Manager Terry Francona officially ruled out Josh Beckett for the team's upcoming Japan trip yesterday, but the Red Sox' ace righthander did take his first step back from a sore back. Pitching coach John Farrell said Beckett threw 25 times from 60 feet and 10 times at 75 feet yesterday on flat ground in Fort Myers, Fla., and that he would move back to 90 feet today. "Everything's good," said Beckett, who had an icepack on his back. "I did everything I wanted to do." Francona, speaking from Bradenton, Fla., where the Red Sox dropped a 6-3 decision to the Pirates, said of the decision on Beckett, "It's not the right thing to do [to send him to Japan]. Everything we say, we need to live by." Francona was pleased with Beckett's work yesterday. "He started out throwing at 60 [feet] and progressed to 75 with no concerns, which was really what we were shooting for," he said. "He'll start ramping it up a little bit from here. The best-case scenario - I say the best-case scenario - is Thursday will be a side day. "He tolerated everything he was supposed to. John was real excited. The ball came out of his hands real nice. " Asked about a target date for Beckett's return, Francona said, "When he's ready to pitch. He'll be ready when he's ready." For his part, Farrell said the possibility of Beckett starting one of the two games in Oakland April 1-2 would be "too aggressive. The one thing about Josh, he's very much in tune with his body. As good as he felt [yesterday], he knows there are steps along the way which we will look to accomplish. "The main thing is even at 75 feet, he got on it a little bit as far as intensity level. I'm sure he wants to go, but he's well aware there will be a throwing program and a plan in place. The fact he feels [no pain in his back] is a clear indication the inflammation has subsided. Now we'll take the appropriate steps to build him up." Knuckleballer Tim Wakefield pitched five no-hit innings in a Triple A game against the Reds at the minor league complex in Fort Myers. He was throwing to his new backstop, Kevin Cash, for the first time in a game since Wakefield's longtime catcher, Doug Mirabelli, was released last week. Wakefield threw 64 pitches, 48 for strikes, while striking out three in exhibiting what Cash called "one of the best knuckleballs I've ever seen him throw." While Wakefield and Cash downplayed the beginning of their new relationship, things went flawlessly yesterday. "I guess he was on," said Cash. "In all the times I saw him last year, this was as good as I've ever seen him. I caught his bullpen the other day and he broke off some good ones, but today, I don't care who he was throwing to, he had a great one." Cash said he felt relaxed because "I was able to follow the ball pretty well. It was a lot of fun because of the way Wake was throwing the ball." "I felt really good," said Wakefield. "I was working on slowing myself down out there. Early on I threw a few fastballs because I was behind on the count in the first inning on a couple of batters, but from then on I was just throwing more strikes with the knuckleball." Wakefield said he had no apprehension about throwing to Cash. "I've thrown to him before," he said. "I've thrown to him on the side and he's always done a good job." Kyle Snyder still doesn't know what his role will be this season, but he added three innings of scoreless work (1 hit, 1 walk) to his spring résumé against the Pirates. "Kyle just knows how to pitch," said Francona. "I don't know what the gun said, and I don't care." Snyder, who said he is scheduled to pitch in the first exhibition game in Japan but was unsure if he'd start or relieve, said he was pleased with the velocity of his fastball, which, he hopes, will complement his offspeed pitches. "The fastball feels better every time out," Snyder said. "I wanted to lock into [the pitch] early on in spring training, and I added a tick or two to it today. "My offspeed stuff will work that much better if I can sell the fastball." Snyder started yesterday, but he is willing to accept any role. "I can chew up innings any way you want me to," said the lanky righthander. "I take pride in that." While agent Scott Boras said he would welcome discussion on a contract extension for catcher Jason Varitek, he said he would not initiate anything. "If the Red Sox are receptive to discussing it, we certainly would be as well," Boras said. Varitek's deal ends after the season . . . Center fielder Coco Crisp (groin) took batting practice again yesterday . . . Prospect Jason Place, a center fielder, hit a long home run in a Double A game . . . J.D. Drew was seen soaking a sore right toe . . . Righty reliever Bryan Corey is on eggshells hoping he'll make the staff. "Everyone has been great and up front with me," Corey said. "I'd love to stay with this team. I feel comfortable with the guys and John Farrell. It's where I'd prefer to be." Corey is getting a lot of attention from scouts from other teams . . . Daisuke Matsuzaka, whose wife gave birth to a son Saturday, likely will return to Fort Myers today, while the Sox are in Tampa to play the Yankees. He's scheduled to pitch Wednesday vs. Toronto, then join the Sox on their charter flight to Japan . . . Francona reported the Sox were prepped by team internist Larry Ronan on ways to ward off jet lag, including a recommendation that they try to stay awake during the flight to Japan, which is 17 hours. Cafardo reported from Fort Myers; MacMullan from Bradenton, Fla.